Marrakech was our first stop in Morocco. Founded in 1062 and known as the “ochre city” for the color of the buildings and walls in the old Arab section, we entered the city on wide boulevards teeming with traffic, chain hotels, modern white stucco buildings and palm trees. I felt disappointed; we could have been somewhere in Florida. But then we passed through the old city walls and a park where camels were sitting in a shady grove. People strolled the streets wearing their traditional jellabiyas and “calls to prayer” were coming from loudspeakers on the minarets of the mosques. This was Morocco! We were staying in a riad, and this one turned out to be a destination in itself. A “riad” is a traditional Moroccan house, located within the ancient medina and designed around a central courtyard, pool or fountain, and garden. The owners had purchased several adjoining houses and combined them so that there are two courtyards and 26 guest rooms, several sitting rooms, two restaurants, a jazz bar, and a spa. The hotelier gave us a tour and showed us to a lovely room which faced the pool and inner courtyard. As I stood on the balcony, I looked out over rooftops of the old city and a minaret a short distance away. Down below was a pool, trees, potted plants, tables covered with white tablecloths, pierced pendant lanterns, and lovely tile work. Each morning at dawn, we were awakened to the “call to prayer” from the mosque. A traditional afternoon tea is offered in the courtyard each day, and we enjoyed typically Moroccan mint tea served with an assortment of tiny cookies. It felt like something out of “Arabian Nights”. Within walking distance of the riad is the Majorelle Garden, a botanical and landscape garden that was created in the 1920’s by French painter Jacques Majorelle. It is a fantastical delight and beautiful to behold. 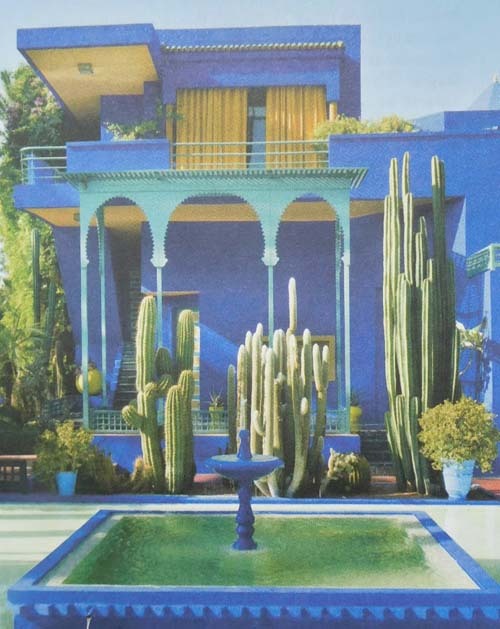 Special shades of bold cobalt blue are used in the gardens and on the buildings, walkways and pergolas, and are a stunning accent to the greens of the cacti, palm trees, bamboo, bougainvilleas, and ferns. Neglected after the painter’s death in 1962, the property was later restored by fashion designer Yves Saint-Laurent who bought the garden and used it as his residence. After he died in 2008, his ashes were scattered in the garden and a memorial was built in his honor. 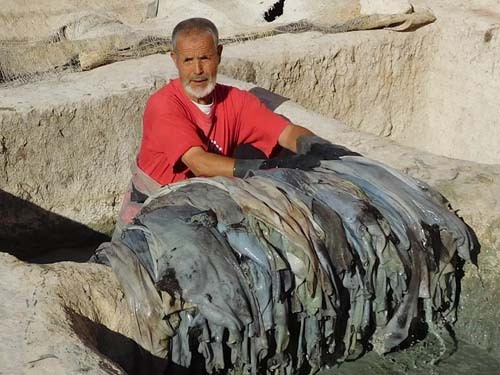 At the top of our “must see” list was a visit to the old tannery that processes hides using a method that is almost one thousand years old. Hides of cows, camels, sheep and goats are soaked for three days in stone vessels containing a mixture of pigeon droppings, limestone, water and salt. The limestone helps to remove the hair and the acid in the pigeon droppings softens the hides. We watched workers standing waist high in this mixture as they removed the skins for the next step in the process, scraping away the excess hair fibers and fat. Then the hides are moved to stone vats containing dyes of many colors where they sit until they are finally ready to be placed out in the sun to dry. At this point, they are sold to the craftsmen who will make them into an assortment of leather products you can buy in the souk. The smell in the tannery was offensive and our guide Mohammed gave each of us a bouquet of mint to hold under our noses as we watched the process. 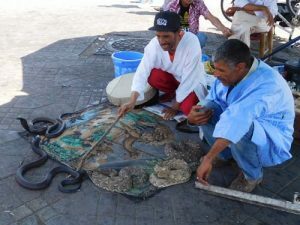 The “souk” is the commercial quarter of the medina and we went there to experience the activity and to bargain for some souvenirs. Colorful stalls line the alleyways, selling everything from carpets to clothing, scarves, jewelry, leather products, olives and housewares. 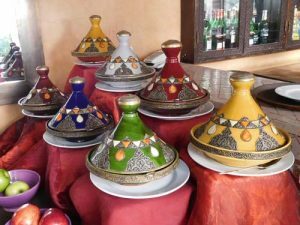 We were on a quest to find a decorative tagine like the ones used on our riad’s breakfast buffet for fruits, nuts and pastries. Mohammed patiently took us from stall to stall until my sister finally found one to bring back home with her. There are no set prices in the souk so she had to use her bargaining skills. It can get rather tense as the seller dramatically tells the buyer that she is “killing” him with the low price she is offering. But in the end, she prevailed and took home a beautiful tagine to use for entertaining in the Moroccan style. We expected to engage in this type of buying and selling process in the souk. But we did not expect the tactics used on the street to capture the attention of the unsuspecting tourist. Men posing as workers in our riad who had the day off said they recognized us from the riad and shared important information about a special shop a couple of streets away. A co-conspirator “happened” to overhear the conversation and offered to show us the way. We started to follow, but then thought better of it. A sign on the wall in the riad warned about these tactics, but we had not noticed it. And to think we almost fell for it! We probably won’t see these “actors” on the big screen anytime soon, but their performance and timing was so well executed that I feel they deserve every dirham of their commissions. There also was an interesting specialty shop in the souk where three Berber women were laboriously extracting oil from the nuts of the argan tree to make food products and cosmetics. 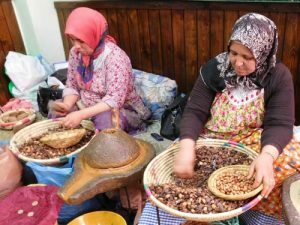 Argan trees are endemic to Morocco and the oil that is extracted is very precious and has many health benefits. A salesman let us sample some of their special products, and we filled our baskets with gifts for people back home. There was no bargaining here because supposedly this is the only place where the skin products are pure and the oils used for cooking are not diluted. Leaving the souk, we entered the beating heart of the city, Place Jemaa El Fna, which dates from the 12th century and was designated a UNESCO world heritage site in 2001. This is a large square inside the walled city, lined with restaurants and shops and the setting for performances by snake charmers, musicians, storytellers, fortune-tellers, henna artists, monkey performers, acrobats, and transvestite dancers. It indeed is an assortment of fantastic sights and smells of Moroccan folklore. One photo here will cost you ten dirham. 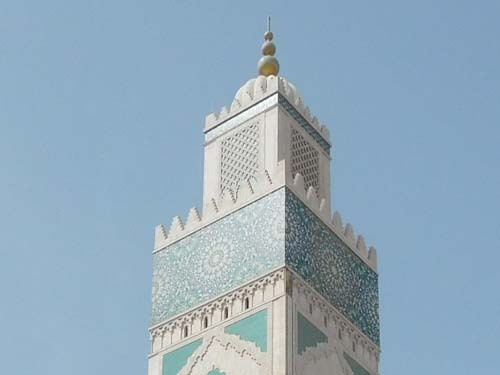 The Koutoubia Mosque with its 254 foot high minaret is a landmark and symbol of the city. We were just outside the mosque when the “call to prayer” came from the loudspeakers above. Not far away is the Bahia Palace, a masterpiece of Moroccan architecture with its brilliant mosaics, carved woodwork and gorgeous marbles. Like most Arab palaces, it contains charming and tranquil gardens, beautiful patios and rooms richly decorated with tiles. And we visited the tombs of the Saâdi rulers which date back to the 16th century but were only discovered and restored around 1917. These tombs shelter the bodies of about 60 Saadian sultans and their families and are an outstanding example of Moorish tilework and art. Leaving Marrakech two days later, we transferred to a four-wheel drive vehicle for our trip over the High Atlas Mountains via the Tizin Tichka Pass. Our destination was Ouarzazate, five hours away. Mohammed expertly navigated the vehicle around hairpin turns and over narrow roads that came within inches of steep drop-offs into canyons below. Besides the scenery, the sights we saw along the way are memorable. Donkeys loaded with meat, produce and wheat were led by jellabiya-clad men to village markets high in these mountains. We passed caves used by the Bedouins, nomadic tribes who live mainly in the desert but use the caves when crossing the mountains on their camels. We caught a glimpse of a road worker pausing for prayer on an outcrop of the mountain. And we saw stork nests, shepherds tending their flocks, and tiny villages made out of sandstone and hay that blend into the color of the hillsides on which they are built. No matter how small the village, there’s always a mosque with its minaret towering above everything. Ouarzazate, nicknamed “the door of the (Sahara) Desert”, was built as a garrison and administrative center by the French, but today it serves as the Hollywood of the Kingdom. This is where “Lawrence of Arabia”, “Jesus of Nazareth”, “Gladiator”, “Indiana Jones” and many other films were made. While it is in a lovely setting, the town itself is somewhat tacky. There are several movie studios that you can tour and new housing developments are springing up in the otherwise beautiful landscape. There are some interesting and beautiful casbahs nearby that have also been the setting for movies. 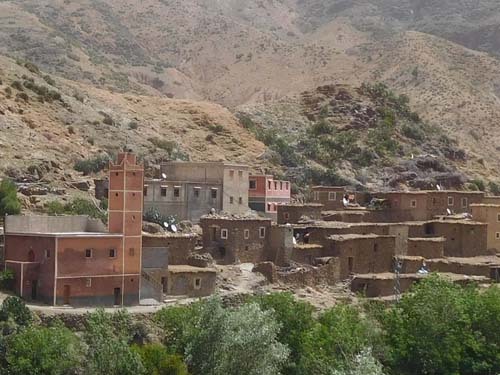 Mohammed led us through the old rooms of the Kasbah de Taourirt and the alleyways of the more famous Ait Benhaddou, both sandstone in color and very picturesque. They show how tribes lived and protected themselves in former times. The pathways into Ait Benhaddou are filled with shops and artisans working at their crafts. A woman sitting on her stoop invited us to see her home. She showed us her “old” kitchen with its bee-hive oven, her “modern” kitchen with its fifties-style sink and tile backsplash, and a small room open to the sky where the sheep were housed in very tight quarters. The living room was full of carpets that she supposedly made herself and would sell for a good price. So the tip we gave her was really for the privilege of visiting her shop. Fooled again! Leaving casbah Ait Benhaddou, we drove for miles through the foothills of the mountains and the rolling sand hills of the desert and started to wonder where we could possibly be staying for the night. Hopefully not in a Bedouin tent! But when we finally came upon our riad, we drove through a large sandstone arch and entered a typical Moroccan courtyard, set in an oasis with palm trees and beautiful plantings around a central pool and fountain. You’d never expect to find a place like this here in such a remote location. But it does make sense—a Frenchman opened it to cater to the movie industry. In order to get to Casablanca, our next and final destination, we had to drive back over the High Atlas Mountains. Casablanca is very busy and teeming with traffic but it has a beautiful new mosque. Hassan II is one of the world’s largest and it was built over six years from “contributions” made by every family in in the city. We also drove by and took photos of Rick’s Café made famous by the film “Casablanca”, and toured the medina with its maze-like streets that are almost impossible to navigate in a car. Everywhere in Casablanca, the driving was terrifying, partly because people play “chicken” as they maneuver in and out of traffic. Unfortunately for us, Mohammed was very good at playing “chicken”. The Islamic month of Ramadan had just started and Mohammed had fasted all that day as we made the long journey from Ouarzazate. Ramadan is a time of spiritual reflection and increased devotion and worship which is observed as a month of fasting from sunrise to sunset. So early that evening, we arrived at the hotel very hungry after the long drive and had to wait until the sun set for food to be served. We were the first ones in the restaurant when the sun hit the horizon! Elizabeth von Pier is a retired banker and photojournalist who travels extensively throughout the world. In her retirement, she has written and published articles in travelmag.co.uk, WAVE Journey, Travel Thru History and hackwriters.com. Ms. von Pier lives in Hingham, Massachusetts.